Osborn served as BlueInGreen's President and Chief Technology Officer during its initial stages as a University of Arkansas startup. BlueInGreen co-founder Dr. Scott Osborn has been named the Engineer of the Year by the Arkansas section of the American Society of Agricultural and Biological Engineers (ASABE). Osborn, who is also an associate professor of biological and agricultural engineering at the University of Arkansas, was chosen for his ongoing contributions to the engineering profession, both inside and outside of the classroom. 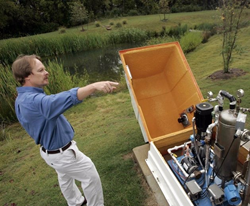 In 2004, Osborn and Dr. Marty Matlock, a professor of biological and agricultural engineering at the University of Arkansas, co-founded BlueInGreen with support from VIC Technology Venture Development. Osborn holds 12 patents related to gas dissolution for water treatment, wastewater treatment, ecological restoration, oxidation and pH adjustment. "Dr. Osborn has been a friend and mentor to the entire team at BlueInGreen, but his impact reaches far beyond this company," said Product Manager Jessica Hart. "His ideas, innovation and instruction have directly and indirectly benefited many people around the world." A licensed professional engineer, Osborn served as BlueInGreen's President and Chief Technology Officer during its initial stages as a University of Arkansas startup and worked with its team of engineers to design and implement the company's first commercial installations. BlueInGreen's systems are currently being used at 27 sites in 14 states and Canada, treating over 700 million gallons of water each day. The company has contributed significantly to the economy of Arkansas through sales revenues, grants and investor funding. Osborn was previously named a Ford Foundation Design Fellow, where he worked to introduce engineering design into the curriculum at the Dwight Look College of Engineering. Osborn is also a recipient of the Massey-Ferguson Educational Gold Medal, awarded for the advancement of engineering knowledge and practice in agriculture soil. He has helped establish biological engineering programs at Louisiana State University, Texas A&M University and the University of Arkansas. "Dr. Osborn is a gifted engineer-educator who is a passionate and effective teacher," said Dr. Lalit Verma, Head of the Department of Biological and Agricultural Engineering. "He utilizes his industry experience in preparing students to be successful engineers to address problems in sustainable food, water and energy systems." Osborn serves as a technical lead on BlueInGreen's Advisory Board. He is currently working in cooperation with BlueInGreen and Core Brewing Company, based in Springdale, Ark., to develop a new application for the company's pH adjustment line in order to make the beer carbonation process less expensive and more environmentally friendly, while also improving beverage quality. "We all owe a huge debt to Scott," said CEO Chris Milligan. "He's a one-of-a-kind teacher and entrepreneur, and his selflessness and leadership directly reflect our company's core values. In many ways, BlueInGreen would not be the same without Scott's early work." ASABE is an international scientific and educational organization dedicated to the advancement of engineering applicable to agricultural, food and biological systems. Further information on the Society can be obtained by contacting ASABE at (269) 429-0300, emailing hq(at)asabe(dot)org or visiting asabe.org.